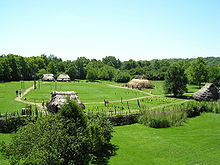 Monks Mound, built c. 950–1100 CE and located at the Cahokia Mounds UNESCO World Heritage Site near Collinsville, Illinois, is the largest pre-Columbian earthwork in America north of Mesoamerica. 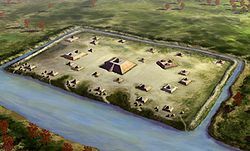 The various cultures collectively termed "Mound Builders" were inhabitants of North America who, during a circa 5,000-year period, constructed various styles of earthen mounds for religious, ceremonial, burial, and elite residential purposes. 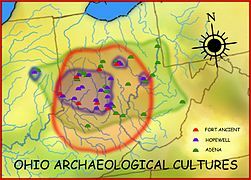 These included the pre-Columbian cultures of the Archaic period, Woodland period (Calusa culture Adena and Hopewell cultures), and Mississippian period; dating from roughly 3500 BCE (the construction of Watson Brake) to the 16th century CE, and living in regions of the Great Lakes, the Ohio River Valley, and the Mississippi River valley and its tributary waters. 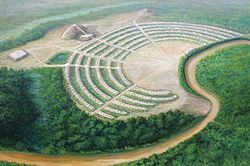 Poverty Point, built about 1500 BCE in what is now Louisiana, is a prominent example of Late Archaic mound-builder construction (around 2500 BCE – 1000 BCE). 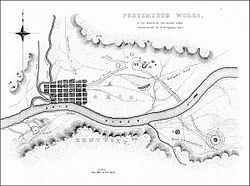 It is a striking complex of more than one square mile, where six earthwork crescent ridges were built in concentric arrangement, interrupted by radial aisles. 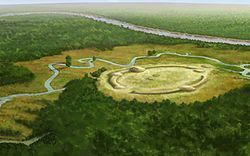 Three mounds are also part of the main complex, and evidence of residences extends for about 3 miles along the bank of Bayou Macon. 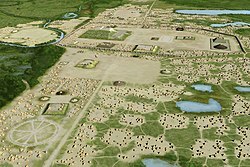 It is the major site among 100 associated with the Poverty Point culture and is one of the best-known early examples of earthwork monumental architecture. Unlike the localized societies during the Middle Archaic, this culture showed evidence of a wide trading network outside its area, which is one of its distinguishing characteristics. 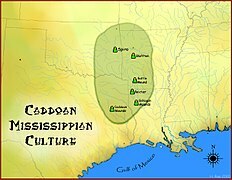 The Coles Creek culture is a Late Woodland culture (700-1200 CE) in the Lower Mississippi Valley in the Southern United States that marks a significant change of the cultural history of the area. Population and cultural and political complexity increased, especially by the end of the Coles Creek period. Although many of the classic traits of chiefdom societies were not yet made, by CE 1000, the formation of simple elite polities had begun. Coles Creek sites are found in Arkansas, Louisiana, Oklahoma, Mississippi, and Texas. The Coles Creek culture is considered ancestral to the Plaquemine culture. 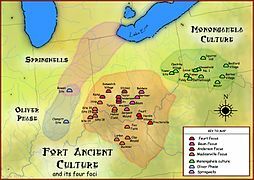 Fort Ancient is the name for a Native American culture that flourished from 1000 to 1650 CE among a people who predominantly inhabited land along the Ohio River in areas of modern-day southern Ohio, northern Kentucky, and western West Virginia. 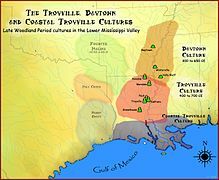 A continuation of the Coles Creek culture in the lower Mississippi River Valley in western Mississippi and eastern Louisiana. Examples include the Medora Site in West Baton Rouge Parish, Louisiana; and the Anna and Emerald Mound sites in Mississippi. Sites inhabited by Plaquemine peoples continued to be used as vacant ceremonial centers without large village areas much as their Coles Creek ancestors had done, although their layout began to show influences from Middle Mississippian peoples to the north. The Winterville and Holly Bluff (Lake George) sites in western Mississippi are good examples that exemplify this change of layout, but continuation of site usage. During the Terminal Coles Creek period (CE 1150 to 1250), contact increased with Mississippian cultures centered upriver near St. Louis, Missouri. This resulted in the adaption of new pottery techniques, as well as new ceremonial objects and possibly new social patterns during the Plaquemine period. 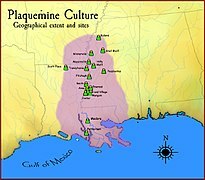 As more Mississippian culture influences were absorbed, the Plaquemine area as a distinct culture began to shrink after CE 1350. Eventually, the last enclave of purely Plaquemine culture was the Natchez Bluffs area, while the Yazoo Basin and adjacent areas of Louisiana became a hybrid Plaquemine-Mississippian culture. This division was recorded by Europeans when they first arrived in the area. 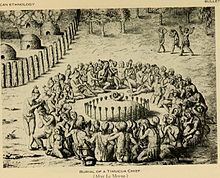 In the Natchez Bluffs area, the Taensa and Natchez people had held out against Mississippian influence and continued to use the same sites as their ancestors, and the Plaquemine culture is considered directly ancestral to these historic period groups encountered by Europeans. 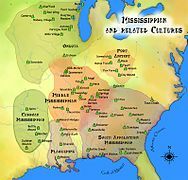 Groups who appear to have absorbed more Mississippian influence were identified as those tribes speaking the Tunican, Chitimachan, and Muskogean languages. Some Mormon scholars[who?] have considered the Book of Mormon narrative a description of the mound-building cultures; other Mormon apologists argue for a Mesoamerican or South American setting. Theories about a Mesoamerican setting for the Book of Mormon did not develop until after Latter Day Saints were influenced by publicized findings about the Central American stone ruins. This occurred after the Book of Mormon was published. The Walam Olum hoax had considerable influence on perceptions of the Mound Builders. In 1836, Constantine Samuel Rafinesque published his translation of a text he claimed had been written in pictographs on wooden tablets. This text explained that the Lenape Indians originated in Asia, told of their passage over the Bering Strait, and narrated their subsequent migration across the North American continent. This "Walam Olum" tells of battles with native peoples already in America before the Lenape arrived. People hearing of the account believed that the "original people" were the Mound Builders, and that the Lenape overthrew them and destroyed their culture. David Oestreicher later asserted that Rafinesque's account was a hoax. He argued that the Walam Olum glyphs derived from Chinese, Egyptian, and Mayan alphabets. Meanwhile, the belief that the Native Americans destroyed the mound-builder culture had gained widespread acceptance. Another hoax, the "Kinderhook plates" "discovered" in 1843, involved material planted by a contemporary in Native American mounds. This hoax aimed to discredit the account of the Mormon prophet Joseph Smith having translated an ancient book. ^ Robert Silverberg, "...And the Mound-Builders Vanished from the Earth", originally in the 1969 edition of American Heritage, collected in the anthology A Sense of History [Houghton-Mifflin, 1985]; available online here Archived 2008-08-28 at the Wayback Machine. 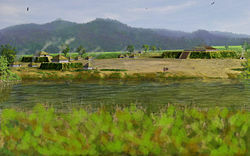 ^ "Troyville-Coles Creek". Louisiana prehistory. 2010-07-01. Archived from the original on 2012-01-10. ^ Adam King (2002). 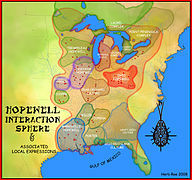 "Mississippian Period: Overview". New Georgia Encyclopedia. Retrieved 2010-07-01. ^ Peter N. Peregrine (1995). Archaeology of the Mississippian culture: a research guide. Garland Publishing. p. 165. ISBN 978-0-8153-0336-7. ^ "Wisconsin Mound Opened: Skeleton Found of a Man Over Nine Feet High with an Enormous Skull". New York Times. December 20, 1897. ^ "Monster Skulls and Bones". New York Times. April 5, 1886. ^ Lincoln, Abraham (1953). "Fragment: Niagara Falls [c. September 25–30, 1848]". In Basler, Roy P. (ed.). Collected Works of Abraham Lincoln. 2. pp. 10–11. ^ a b c d e f g h i Feder, Kenneth L. (2005). "The Myth of the Moundbuilders" (PDF). Frauds, Myths, And Mysteries: Science and Pseudoscience in Archaeology. Central Connecticut State Univ: McGraw Hill. pp. 151–155, 159–160, 164–166. ISBN 978-0-07-286948-4. Retrieved May 19, 2012. ^ Chapman, Jefferson. "Prehistoric American Indians in Tennessee". University of Tennessee, Knoxville. Archived from the original on 2012-02-05. Retrieved 2012-02-08. ^ Jon Daniels. "The Book of Mormon and Mesoamerican Archeology". Stanford University. Archived from the original on 2011-11-19. Retrieved 2012-02-08. ^ "The Mound Builders of North America Part I". Federation : MSTA. Retrieved 2017-12-24. ^ "The Black Washitaw Nation of America". Retrieved 2017-12-24. ^ Ohio Historical Society (1901). Ohio history, Volume 10. Retrieved 2011-07-25. The Garden of Eden, it seems, is now definitely located. The site is in Ohio, "Adams" county, to be more precise...The Rev. Landon West of Pleasant Hill, O., a prominent and widely known minister of the Baptist church... arrives at the conclusion that this great work was created either by God himself or by man inspired by Him to make an everlasting object lesson of man's disobedience, Satan's perfidy and the results of sin and death. In support of this startling claim the Rev. Mr. West quotes Scripture and refers to Job 16:13: "By His spirit. He hath garnished the heavens; His hand hath formed the crooked serpent." ^ Brook Wilensky-Lanford (May 23, 2011). "Adam and Eve –and Reverend West – in Ohio". The Common. Archived from the original on 2011-11-04. Retrieved 2011-07-25. The Eden I found in a 1909 pamphlet by Reverend Landon West—the Serpent Mound earthwork that is now an Ohio state park—was still preserved for all to see, so I went...Details that fell outside of West's lifetime were hard to fit into the book: his son Dan West became the founder of the Heifer Project charity, and his accomplishments no doubt helped preserve the memory of his father's Garden of Eden. ^ Hearn, Lafcadio (April 24, 1876). "The Mound Builders". The Commercial. Retrieved May 17, 2012. ^ Kimball, Stanley B. (Aug. 1981). "Kinderhook Plates Brought to Joseph Smith Appear to Be a Nineteenth-Century Hoax". Ensign (LDS Church). Retrieved May 17, 2012. ^ Evans, Glenn; Groat, Joel B. (2003). "Joseph Smith and the Kinderhook Plates: Overview and Current Perspectives". Mormons in Transition (IRR). Retrieved May 17, 2012. Squier, E. G.; Davis, E. H. (1847). Ancient Monuments of the Mississippi Valley. Washington DC: Smithsonian Institution.